1993: Teemu Selanne becomes the third rookie in NHL history to score 50 goals in a season. 1929: The Chicago Blackhawks are shut out for an NHL-record eighth consecutive game. But they don’t go home empty-handed: Blackhawks goaltender Charlie Gardiner matches New York’s John Ross Roach in a scoreless tie at Chicago. Roach sets a Rangers record with his 13th shutout of the season. 1960: The United States wins its first hockey gold medal at the Winter Olympics by scoring six goals in the third period to defeat Czechoslovakia 9-4 in its final game at Squaw Valley, California. The U.S. trails 4-3 after two periods, but Roger Christian scores three times in the third; his brother, Bill Christian, assists on two of the three goals. Bill’s son, Dave Christian, follows in his father’s footsteps by helping the 1980 U.S. “Miracle On Ice” team win gold at the Lake Placid Olympics 20 years later. 1963: Andy Bathgate scores three goals for his fourth NHL hat trick in the Rangers’ 6-1 victory against the Blackhawks at Chicago Stadium. Bathgate becomes the first player in Rangers history (and the 10th in NHL history) to score 250 goals. 1974: Boston Bruins defenseman Bobby Orr is credited with the 499th and 500th assists of his NHL career in his 522nd game, an 8-1 victory against the Detroit Red Wings at Boston Garden. Ross Brooks, Boston’s 36-year-old rookie goaltender, ties an NHL record with his 14th consecutive victory. 1974: Claude Larose scores four goals to help the Montreal Canadiens defeat the Pittsburgh Penguins 7-1 at the Forum. It comes two nights after Larose has a hat trick in a 6-5 win against the Atlanta Flames at the Omni. 1999: Los Angeles Kings center Ray Ferraro plays in his 1,000th NHL game, a 1-0 loss at the Dallas Stars. Ferraro joins Doug Bodger, Russ Courtnall and Garry Galley as the Kings became the first NHL team to have four players reach their 1,000-game milestone in the same season. 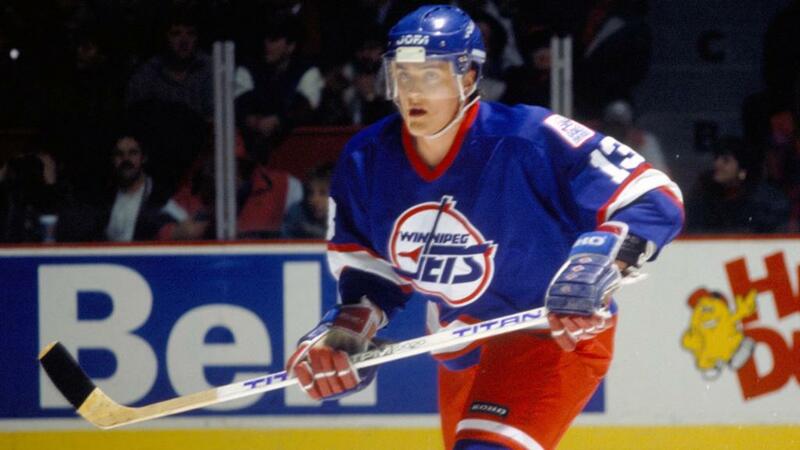 1993: Teemu Selanne becomes the third rookie in NHL history to score 50 goals in a season. Selanne scores Nos. 48, 49, 50 and 51 to help the Winnipeg Jets defeat the Minnesota North Stars 7-6 at Winnipeg Arena. Selanne scores his 48th of the season at 8:53 the first period, gets his 49th and 50th goals late in the second and scores No. 51 at 7:33 of the third period. Exactly four years later, Selanne, now with the Mighty Ducks of Anaheim, scores his 200th NHL goal in a 4-1 road win against the Washington Capitals. 2017: Barry Trotz becomes the sixth coach in NHL history to reach 700 victories when the Washington Capitals defeat the Rangers 4-1 at Madison Square Garden. Marcus Johansson scores two goals to help Trotz join Scotty Bowman, Joel Quenneville, Al Arbour, Ken Hitchcock and Lindy Ruff as coaches who’ve won 700 NHL games. “It means I’ve been around a long time,” said Trotz, who’s in his 18th season as an NHL coach and third with the Capitals after spending 15 with the Nashville Predators.